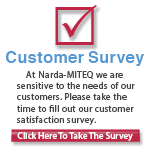 L3 Narda-MITEQ attained its original ISO 9001 registration in June 1993, when fewer than 1500 companies were registered. ISO 9001 has since become a globally recognized standard for quality for commercial products. Nationally, it was accepted by an ever-increasing number of government agencies in place of long standing military quality and inspection criteria such as MIL-Q-9858 and MIL-I-45208. In May 2010 L3 Narda-MITEQ achieved AS9100 registration, expanding our scope and commitment to include the Aviation, Space and Defense Industries. 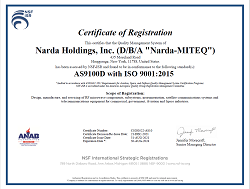 L3 Narda-MITEQ is now registered to AS9100:2009 (Rev. C) as well as ISO9001:2008 by National Quality Assurance USA (NQA), an accredited registrar of the ANSI-ASQ National Accreditation Board (ANAB). NQA performs Quality System audits at L3 Narda-MITEQ every six months assuring continued compliance. Additionally, internal audits, management reviews and monthly quality reports assure the Quality Management System is continually improving at L3 Narda-MITEQ.